PanARMENIAN.Net - More than 550 ceasefire violations by Azerbaijan were registered on the contact line with Nagorno Karabakh (Artsakh) over the past week. Azeri forces employed various caliber firearms as well as 60- and 82-mm mortars and grenade launchers in different sections of the frontline. 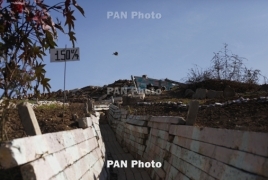 Artsakh defense army troops retaliated to continue protecting their positions. The Nagorno Karabakh Republic Defense Army serviceman Armen Harutyunyan, 21, was lethally injured in Azeri gunfire on May 26. The soldier was killed in the northern direction of line of contact, at an NKR army unit’s defense position.